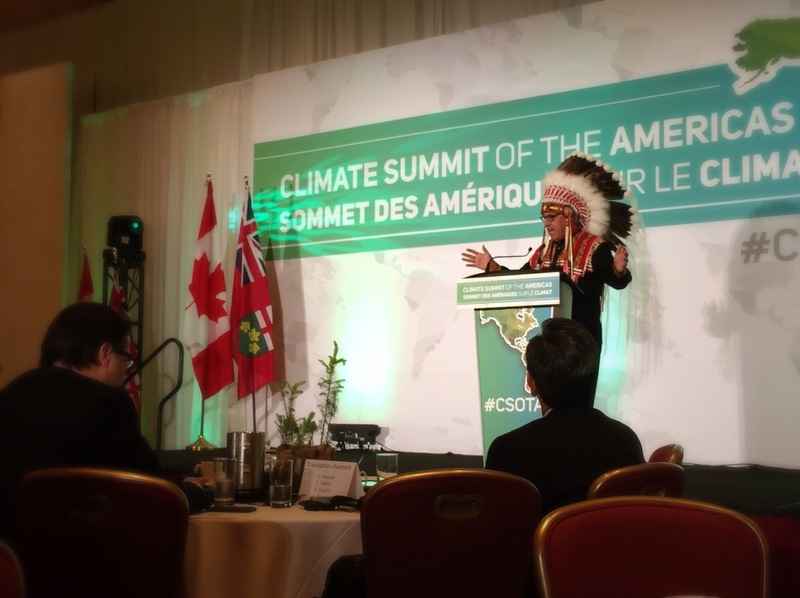 The Climate Summit of the Americas, hosted by the provincial government of Ontario, brought together infranational leaders from the US, Canada and Latin America. These ministers and heads of government from 23 jurisdictions around the hemisphere gathered to share their experience of effective climate action and to agree to a shared Climate Action Statement—the first of its kind. Cities and territories don’t have official standing in the global climate negotiations; they need to be invited by their national governments, or by an NGO observer, and can’t negotiate as cities or territories. While the Lima-Paris Action Agenda and the NAZCA Portal focus on subnational and non-state actors’ contributions to the global climate response, these leaders still have no recognized role in the process. So, a concerted effort is being made to ensure their leadership, their insights, and their capabilities, are put into action. Just prior to the Climate Summit of the Americas, the World Summit of Cities and Territories in Lyon, France, on July 1 and 2, brought local government officials together to discuss ways to work across borders to catalyze stronger climate action. Cities and provinces are taking action, often with more concrete detail and ambition than national governments, and that they can learn from each other. So, the Summit established this principle: municipal, state and provincial governments—infranational governments—need to work together. Local insights, whether from public officials, civil society, the business community, or traditional cultures, must be counted as genuine leverage for enhanced action. 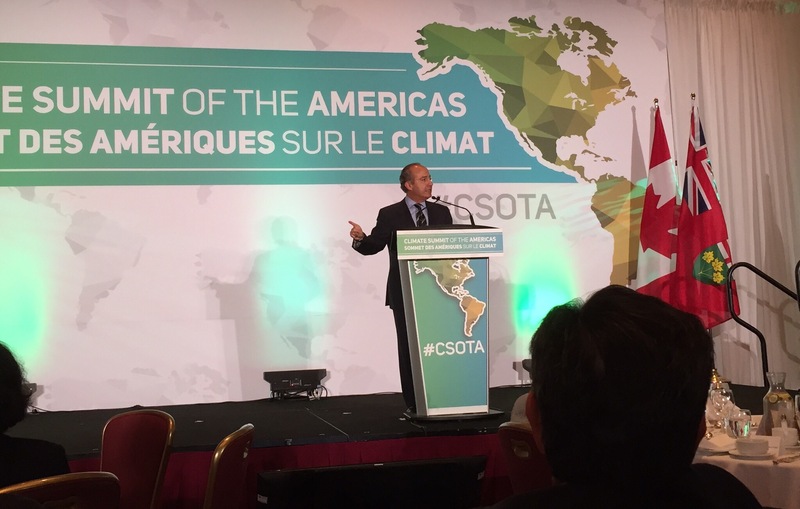 Felipe Calderón, former president of Mexico and chair of the Global Commission on the Economy and Climate, explained that the new low-carbon economy is not one option among many, but the only way we can secure a livable future for humankind. During a rousing speech, Al Gore cited investment in low-carbon economic development as the biggest economic opportunity humankind has ever known. Climate disruption poses the most serious threat to vulnerable traditional communities, whose way of life is disappearing. There is a spiritual component to this work, a question of what we hold in our consciousness, and whether we honor what is sacred. We are all connected: what happens to the Inuit and to other First Nations peoples happens to all of us. Sheila Watt-Cloutier, speaking for the Intuit and other indigenous peoples of the Circumpolar Region, said an entire way of life, informed by generations of human wisdom and collaboration, is at risk of disappearing. This would be a loss for all of us, a piece of our world and wisdom gone, and called on everyone present to honor the sacred and protect the vulnerable. Chief Larry Sault struck a note of inspiration and deep ecological ethics, saying that “armed with respect and love for Mother Earth … we are stewardship warriors”. Chief Sault called on all present to commit to that standard. There are major costs inherent in the status quo, but also major opportunity costs inherent in not acting boldly to motivate low-carbon energy production and development. The US, EU, China and Brazil, have all discovered that low-carbon technology and emissions reduction facilities can be sources of serious export value. Gov. Jay Inslee of Washington, which borders Canada, made the chilling observation “The rainforest is on fire,” referring to the more than 100 wildfires raging across the Pacific Northwest. Gov. Inslee noted he had breathed the smoke of British Columbia’s fires when he left his home to travel to the Summit. Dislocation of reliable climate systems and deepening sustained drought conditions now pose major threats to agriculture. Glen Murray, Ontario Minister for the Environment and Climate Change, noted that 80% of the regional apple crop had been lost in one year. “When you can’t reliably grow apples in Ontario” served as a canary in the coal mine insight, and an indicator about the hidden costs of inaction to curb climate destabilization. Eliminating emissions of climate forcing gases is a moral and economic imperative. Doing so without a strong, reliable, and catalytic carbon price is much more expensive. Many of the jurisdictions represented are actively pricing carbon in some way, and benefitting from doing so. Mary Polak, of British Columbia, was widely recognized for the province’s leadership in implementing a revenue-neutral carbon tax returns that revenues to the people through tax rate reductions of various kinds. Ontario, Quebec, and California, are forming a common market for buying and selling permits and credits, to facilitate an overall capping of greenhouse gas emissions, within certain sectors. Brazilian states are looking at forestry and land use as crucial to both sustainable development and to catalyzing carbon pricing and emissions reductions, at home and abroad. We heard from the 9 US states participating in the Regional Greenhouse Gas Initiative. The RGGI states have seen an 18% reduction in emissions, while enjoying higher GDP growth than the rest of the US, more than 9% since RGGI came into force. 9 states across the Northeast and Midatlantic regions of the United States are cooperating through the Regional Greenhouse Gas Initiative (RGGI), an interstate pact that entails capping emissions and trading permits. The 9 participating states have seen 18% reduction in emissions, while enjoying higher GDP growth than the rest of the US, more than 9% since RGGI came into force. Gov. Peter Shumlin, of Vermont, touted his state’s rising quality of life, as communities become more sustainable, the energy sector gets cleaner, and more vibrant local businesses spring up from a rising culture of creative collaboration. He painted a vision of a race to the top, and traced the history of his state’s rapid deployment of solar energy. Mexico was represented by the states of Baja California and Jalisco, but also by Undersecretary Rodolfo Lacy, who has responsibility for Mexico’s national carbon tax, which came into force in January 2014. Mr. Lacy explained during the Intergovernmental Panel on Carbon Pricing that Mexico designed its carbon tax to be applied at the source, and to be rooted in the molecular chemistry of the raw material itself. Mexico did this, because there was a need to make sure the price was “democratic”, meaning it would not vary wildly and would allow everyone to plan around a clear price signal. Using molecular chemistry means each sector and each kind of fuel could be treated equally, while pricing at the source means the administrative monitoring is much simpler. Mr. Lacy also explained how Mexico plans to reward early actors, providing Certified Emissions Reduction credits (CER) that can be used “to pay the tax”. Currently, the CER—which also must correspond to actual reductions demonstrable through the molecular chemistry of the activities in question—can be used to offset some tax liability, but in 2017, Mexico plans to make its CER tradable on California’s carbon market. This would allow for both compensation of early actors and for full payment of the carbon tax. The tradable CER also points to another key insight that was commonly shared, in various ways, throughout the two-day summit. California’s economy is so large, and its policy choices so close to the leading edge, that joining with California is a way municipal and provincial governments from around the hemisphere can strengthen the resolve and viability of their own policies. One leader put it this way: California’s fuel efficiency standards are North America’s standards. Once the market adjusts and does business better, the pioneering jurisdiction becomes the market leader. There is influence there, and though Ottawa or Brasilia may not be fully supportive of the boldest actions taken by a state or provincial government, cross-border collaboration can add hemispheric or even global reach to otherwise local policies. Another subject of major discussion was the level of opportunity inherent in carbon-emitting fuels versus clean energy. Canada has an export market for carbon-emitting fuels that exceeds $120 billion. The federal government finds it hard to conceive of going without that windfall. But indigenous and subnational leaders, as well as scientists and economists, warn that those exports are not really a windfall; there are huge costs to Canada and to the world, which can no longer be ignored. Meanwhile, other jurisdictions are capturing the clean energy opportunity. Tesla is building the world’s best cars, but Canada’s automotive sector is not capturing the clean vehicle opportunity. Tesla is also building more battery capacity than the world currently has, and the benefit is going to places within the US. Gov. Inslee touted his state’s work on cutting-edge vanadium flow batter technology, while Gov. Shumlin of Vermont talked about his state’s local energy committees, made up entirely of citizen volunteers who are building a low-carbon economy that benefits their communities. Business leaders and governments are redesigning the architecture of finance to steer us toward a low-carbon future. The G7 have agreed to support the decarbonization of the global economy. Whether everyone at the federal level understands this or not, the market for carbon-based fuels is going to go away. Canada can keep incentivizing production, but the world is moving in a different direction. Last November, the US and China announced an agreement to move toward low-carbon technologies together. China has a similar deal with the EU, and the EU with the US. The United States recently announced an agreement with Brazil recently as well. And microgrids are seeing unpredented expansion in their coverage, making a majority solar economy much more feasible. Add to this the fact that last year, most new power generation came from renewables, global carbon emissions did not expand, and a record number of subnational jurisdictions and national governments joined the club to price carbon, and you get a clear picture of where things are heading. This morning, the emerging Carbon Pricing Leadership Coalition brought governments, intergovernmental bodies, business leaders and civil society organizations together to chart a course toward an economically efficient transition to low-carbon energy. Business publications are actively calling for carbon pricing as a way to expand economic opportunity, spur new investment, lower energy prices, and achieve long-term macroeconomic health and stability. And, today in New York City, Republican party donors are gathering to focus on how to motivate climate action within their party. There is real concern the party will lose for the long term if it does not do this. There is a discernible shift happening in the policy and political landscape, regarding climate action and low-carbon development. During the 21st Conference of the Parties to the UNFCCC (COP21), in Paris, from Nov. 30 to Dec. 11, the world’s leaders will work to firmly establish the direction of travel. All 196 nations that are parties to the UN climate treaty will introduce low-carbon development strategies in anticipation of COP21. The Paris agreement will establish a global standard of “escalating ambition”, rooted in evolving national “capabilities”, with “no backsliding” allowed. Laggards will lose clout in diplomatic negotiations of all kinds. By convening this summit, and by working together to bring all of this insight into the light of day, Ontario’s provincial leadership modeled what the world most needs now—a sense of responsibility to the rest of humanity and a willingness to lead in an inclusive and collaborative response.